Newly proposed changes to the rules of golf are ‘geared toward having people enjoy the game and have an opportunity to play|! !|’ says Joanne Flynn|! !| director of golf operations at Windham Country Club. The first overhaul in centuries of the rules of golf was undertaken recently, with game leaders hoping proposed changes will speed the game along and make it less complicated. 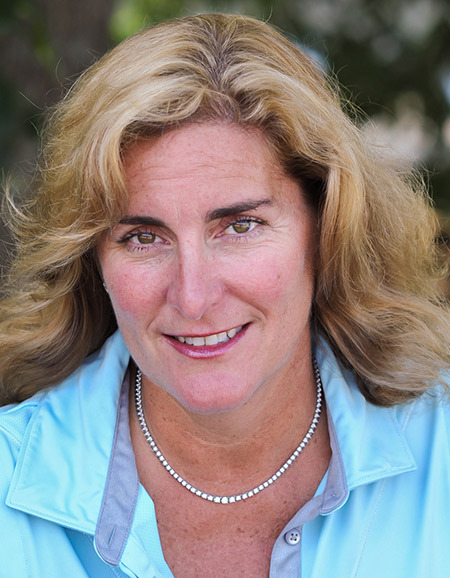 New Hampshire PGA member Joanne Flynn is director of golf operations at Windham Country Club, which opened in 1995 as a public facility. Flynn is preparing to help customers understand the changes which, at this time are in the proposal stage and would not take effect until 2019, if adopted. Q. What's the biggest golfer complaint about the current rules? A. I would say the biggest complaint is probably the amount of time it takes, that they don't have five or six hours to be away from their family. I think the rules are too complicated. They are very difficult to read, and there's just too many of them. People want to get out there and enjoy themselves. A lot of emphasis now is more on fun for people and social aspects, and they're not as concerned with the technical or more stringent rules, and kind of a lot of the history of golf has been very strict, shall we say. Q. Anything that's almost 300 years old is just going to have rules and rules piled up to the point of 700 pages. A. Absolutely. The decision manual is really the book you need to go to because the rule book, as condensed as it does look, is very difficult, so you have to go to the decision manual and look through thousands and thousands of different situations. Honestly, you don't have time for that ahead of time. People aren't going to spend time learning the rules if it's that complicated or, if you're on the golf course, to understand what rule might be enforced. If you're on the golf course and you have a question about a rule, are you going to spend half an hour on a book trying to determine what it is, or, what they tell you now is you play a second ball? Q. Let's get to some of the specifics that are being proposed. One is a player will not receive a penalty if the ball or ball marker accidentally moves on the putting green or in search of a ball. A. I think what they're saying, is the only time somebody should really be penalized is if they do something purposefully. People are human. They're going to make mistakes. Somebody trips or something happens and inadvertently it moves, I don't see that it's necessarily fair to penalize them for that. Q. Another proposal is that players can leave the flag stick in the hole while putting. A. That, I think, speaks to a speed issue, as far as speeding up the game, as well as continuous putting, where people can just putt until they get into the hole instead of taking turns and so forth. One thing with the flag stick in the hole, the thought is if you do hit it too hard, it can slow it down. It can act as a hindrance, and it can act as a help, so I guess being that it would be in favor of speed, I agree with it. Q. Players may repair spike marks or other damage, including footprints, on the green with no penalty. A. I actually have always thought that that should be considered because when you're trying to assume that people are playing under the same conditions, when you have something like a spike mark or damage that might have occurred in the course of play, then people aren't necessarily playing the same golf course. I'm telling you, especially when there used to be metal spikes, there was nothing pleasant being behind a guy that had a size 13 foot, who might 250 pounds because he left marks. I do think that's a long overdue change. Q. Caddies will no longer be able to line up a player. This will be a big change on the LPGA tour, where many players have their caddies line them up before stepping away, just before the player makes a swing. A. I think that's going to be probably the biggest complaint. As you pointed out, the LPGA, if you watch them, every one of their caddies lines them up, even more so than the men's tour. I don't know why necessarily that is. I do think a lot of times women struggle with alignment, and it's obviously easier if somebody can be right behind you and tell you that. I think it's great that it'll speed things up. I think the caddies have spent so much time lining them up that it has hurt the game because it shows these amateurs that you have to be obsessed about it. Everything they're showing people is spending more and more time, and people have no time. Q. Players who have trouble in bunkers could get relief. If you want, you can remove your ball from the bunker, place it in the fairway or right behind the bunker, depending on where the bunker is, and accept a two-stroke penalty. A. I don't have any problem with that. I thought about that, and actually the people that it's going to apply to are the people that need the help anyway. It's not going to apply to very good amateurs, because they're not simply going to walk up and move the ball. They're going to hit it first. Say they opt to hit it first, they're obviously going to hit it a second time, so I think the people that it's going to apply to is the people that need to have more fun and play recreational golf. Q. Time searching for a lost ball would go from five minutes to three. A. Perfect idea. Most people spend more than that anyway, and if you figure you’re playing partners, or whoever you're playing with, typically they're helping you look. If you've got three people trying to find your ball, I think three minutes is sufficient. Q. There's a proposal calling for players to take no more than 40 seconds to play their shot. A. That might be the best idea ever, actually, because again, not to blame tour players, but when you watch people play golf on TV, they spend so much time prepping and setting up, and honestly, those are the people that probably need to spend the least amount of time because they're good. You should never ever stand over a ball that long. The longer you stand over a golf ball, you're just paralyzing yourself. Your muscles are getting tense, you're running over 400 swing-throughs, all these things are coming in to your mind about your swing and the shot you're going to hit, and they're going to cripple you. Q. Will top-tier players be upset about this time limitation? A. Oh, I'm sure. You look at some of the tour players, and not to name names, but there's a couple that they have a little part of their setup that they stand over the ball and take half swings, or take several practice swings, and there's just no need. Like I said, there's no need for them to spend that much time. They should be not only playing the game to the best of their ability, but they should be promoting the game and promoting it in a way that other people are going to enjoy it because it's really going to come down to the survival of golf being for the average person enjoying it. Q. If implemented, how will these proposed changes benefit your business and your customers? A. I think overall my customers will be really happy with the changes because the golf course should play faster. Again, if it plays faster, it's less time away from maybe their kids' games or their family time. The other thing is with rule changes. Now I get a lot of families that play and a lot of juniors that play, this is a friendlier environment for them because now they don't have to be so upset if they hit it in the bunker. Q. As players and customers learn of these proposals, will you solicit their feedback? A. Sure. I believe that we have until August 30th or so to give our feedback, and I definitely know once the season starts, this will be absolutely kind of foremost on everybody's mind because I think everybody wants to weigh in. It's geared toward having people enjoy the game and have an opportunity to play. I think that's what a lot of the rule changes are. Q. I wonder what took so long to get to this point because obviously things came to a head, and now they’re actually being acted upon. A. Number one, how old is golf? It's a tremendously old sport, and a lot of people wanted to maintain the integrity, if you would, of the sport. They want to maintain the integrity of the game in the traditional sense. The problem is with a lot of things, traditions have to change. They have to adjust. It's a whole new world than it was 200 and 100 years ago. It's a whole new world than it was 10 years ago. Just the way people learn, the way people want to do things, the time they have in their life, the technology, everything that's changed about it, golf just needs to take a look and see what people want. They can't keep saying, “Here's what we think you should want, because here's what golf is, and here's how you have to accept it.” Well, people don't have to accept it. They don't have to play. I think what they're looking at now in the past 10 years when golf is not as popular as it might have been before, why not and what can we do to capture that audience. Q. Finally, what new rules will be in place for the 19th hole? A. Well, they might have more time to come in and have a cocktail than they did if they play a little faster. We're planning on a lot of different things too to make it social. With my men's leagues, we have a program now this year where they're going to play golf, but then we're going to do some after-events because they want to be entertained as well. We're trying to get a few more things going during the league for competitions that keep them interested because a lot of times, they're no longer interested just in playing nine holes and their score.